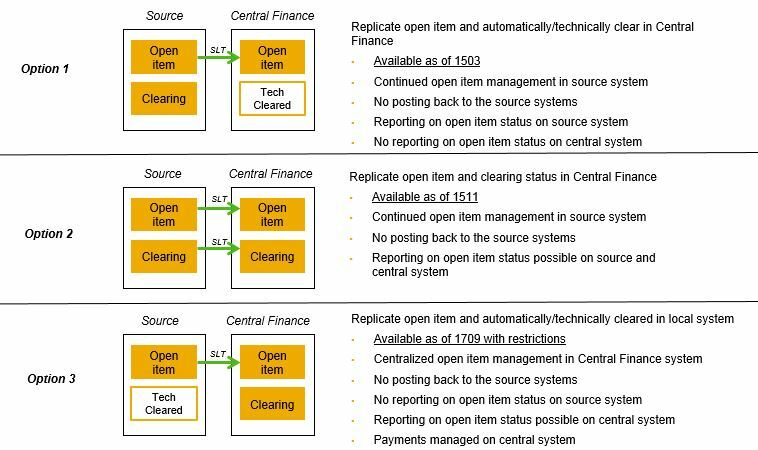 The purpose of this post is to provide some insight and tips into the re-opening of technically cleared items from the Central Finance system. As part of the FI initial load posting open items from the source system (e.g. AR, AP and GL) are transferred to the central as technical cleared. What this means is that the clearing document is set as “ALE-extern” and it is not possible to run any open item reports or run KPI’s such as days sales outstanding or days payable outstanding. SAP offer three options to handle clearing as described by the below. The remainder of this post is focused on Option 2 only. SAP Note 2292042 needs to be followed to implement clearing functionality, this is in pilot release and you need to raise an incident on component FI-CF-AC to access it. The functionality is actually generally released but SAP are tracking customers who are using it by having them request access via this note. Alignment of additional currencies between source and central company codes, for example local currency, group currency and hard currency settings. This alignment ensures that BSEG currencies values match and clearing processes work successfully. Document summarisation configuration is aligned. If multiple systems are connected to the central finance instance with various summarisation settings then company code specific summarisation needs to be used in transaction OBCYX. This makes sure BSEG item numbers match between source and central systems to enable successful clearings. The open item managed indicator on GL accounts needs to be aligned for all open item managed account. Differences will cause failure in clearing postings. The initial load will load all open items AR, AP and GL (from 1610) and set the clearing document as “ALE-extern”. This means any open item reports will not work on the central system, for example FBL1N, FBL5N, FBL3N when selecting the “Open item at key date” option. The date for determining when open items are transferred by is the “Start – Documents” and “Period – Documents” values in the view VCFIN_SOURCE_SET on source system. In the example shown here, the documents starting date is from period 1 fiscal year 2018. Assuming a calendar fiscal year variant all open items will be selected from 31 December 2017 on initial load extract and transferred to the Central Finance staging tables ready to be posted as part of the initial load process as “technically cleared”. After the initial load posting is completed, to re-open all open items you run transaction FINS_MIG_CJ3 on the central system. What this does is read the data posted in ACDOCA and look at open items on source system(s) and it will re-open the corresponding documents on Central Finance. At this point the open item transactions should reflect accurate clearing status in FBL1N, FBL3N and FBL5N etc. Depending on your S/4 HANA system settings, the volume of data in ACDOCA to re-open and the available number of update work processes available on your servers performance can be severely hampered if you enter too many batch jobs. I encourage you to limit the number jobs and gradually increase if no issues are observed. A high number of jobs could exhaust the update work processes and slow system performance (check update requests in SM13 while the jobs are running). It pays to run FINS_MIG_CJ3 at least twice to ensure all open items are re-opened. It can also be run as often as needed each time a new initial load is completed if you are phasing in multiple company codes and/or systems. Transaction FINS_MIG_MONITOR_CJ3 – Re-Open Technical Clearings can be used on the Central Finance system to monitor the re-open process. This provides an overview of the number of documents to be opened and the status. Not all customers will want to follow this approach and re-open technical clearings. For some it may not be relevant from a process perspective so they opt to simply replicate all postings set as technically cleared. For others they may have chosen the central payment option in which case the source system documents are set as technically cleared and open items are paid from the central system (refer SAP note 2346233 – raise an incident on component FI-CF-APR to access this pilot note). Thank you for providing this content to the community! We are facing performance issues with this CJ3 program right in our project CFIN project. Could you please share additional tips or advices. Based in your schema we are using the Option 2. Where are you having performance issues exactly, when trying to re-open technical clearings?. How many update work processes are available on your system and what is the data volume? The SAP CF team are quite helpful it may pay to raise an incident on component FI-CF-AC. The note has nothing to do with Central Finance. Sorry about that, the correct note is 2292043. For some reason I am unable to edit the blog to make this update.